Police Scotland is investigating complaints of sectarian singing and anti-social behaviour by Celtic fans during their Scottish Cup win at Stranraer on Sunday. 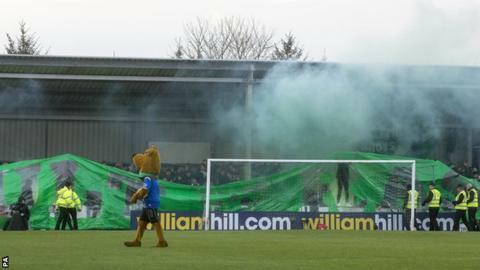 Three Celtic fans have been banned indefinitely after smoke bombs were released at the fourth round tie. "Those responsible simply do not care about our club, our reputation or the safety of our fans," said Celtic. "The club will be reviewing its ticket allocation procedures." Premiership leaders Celtic will travel to Lowland League side East Kilbride or East of Scotland Premier League outfit Lothian Thistle Hutchison Vale in the fifth round. Police Scotland announced that four supporters were arrested for a number of football-related and public-order offences. It says that its post-match investigation will focus on "the use of pyrotechnic devices, smoke bombs and fire crackers which were set off within the terraces as well as being thrown onto the field of play". Police will also be investigating alleged outbreaks of sectarian singing and chanting. "The behaviour of a minority on the day was unacceptable," said superintendent Steven Lowther, who was Sunday's match commander. "What was supposed to be an enjoyable event for all was tarnished by a group of individuals who were intent on singing sectarian songs as well as letting off smoke bombs and pyrotechnics within the crowd. "It is evident that those involved had no concerns for either the safety of others or how their behaviour spoiled what should otherwise have been an event where the post-match discussion should have centred on football and not their antics." The club statement added: "Ensuring the safety of our supporters and staff is always of paramount importance to Celtic Football Club. "If such behaviour was to continue, the reality is it would only be a matter of time before serious injury is caused. However, we will not allow safety to be compromised by the actions of a tiny minority. "We have been inundated again by our supporters following yesterday's events and those fans can rest assured that this issue will be dealt with in the strongest terms. We cannot and will not allow this minority to destroy the magnificent reputation which our fans have earned over many years."